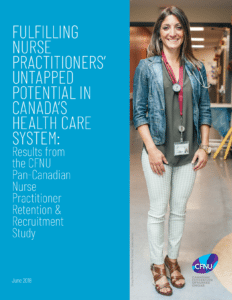 The Canadian Federation of Nurses Unions Pan-Canadian Nurse Practitioner (NP) Retention & Recruitment Project aims to improve NP working conditions to better retain and attract NPs and expand NP positions throughout the health care system. About three million Canadians receive care from an NP, but their numbers are not sufficient to meet the growing needs of an aging population. 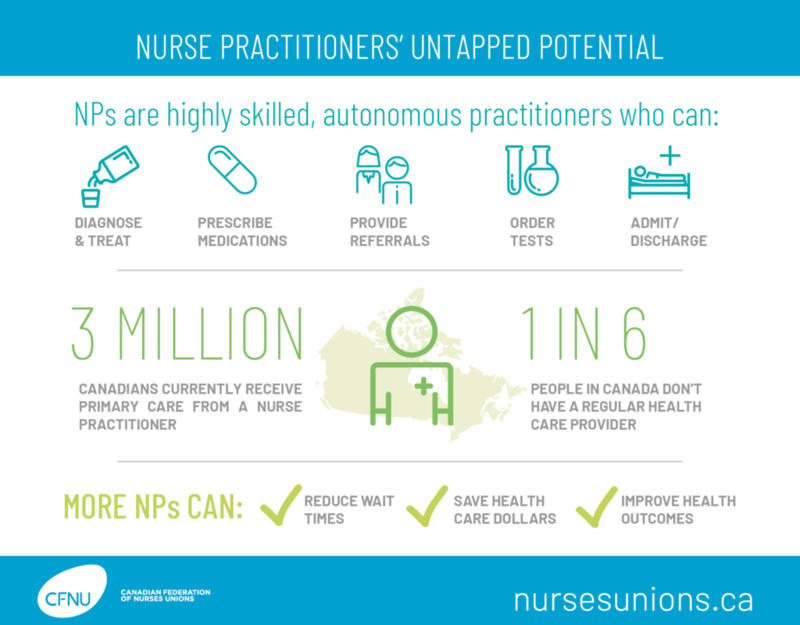 The CFNU Pan-Canadian NP Retention & Recruitment Project was undertaken between November 2017 and June 2018 to help develop recommendations for the expansion of NPs within our health care system to improve timely access to health care for all those living in Canada. The project included an online bilingual pan-Canadian survey with responses from every province and territory, except Yukon, email surveys soliciting specific information from Principal Nursing Advisors and nurses’ unions, an analysis of data from CFNU’s annual contract comparison documents, CIHI/CFNU geo-mapping of access to primary care providers, and a comprehensive literature review (peer-reviewed and grey literature over a 5-year period) with a thematic analysis of data and recommendations based on the results of the project. An Advisory Committee, with representation from NPs from across Canada, worked with the CFNU in developing this report. Download the report. On June 29, 2018, it was presented to Canada’s Health Ministers at their annual meeting held in Winnipeg, Manitoba. Read the media release. To the left of the Layers panel there will be three icons. Click on the icon that depicts three pieces of paper stacked on top of each other. This panel will list all possible layers in the document. Click on the layer folders to show the available options. Click the eye icon beside the layer name to make it visible/invisible.